When colleagues greet, they shake hands. When families greet, they hug. And when fish greet, they do the Happy Salmon—now you can too! 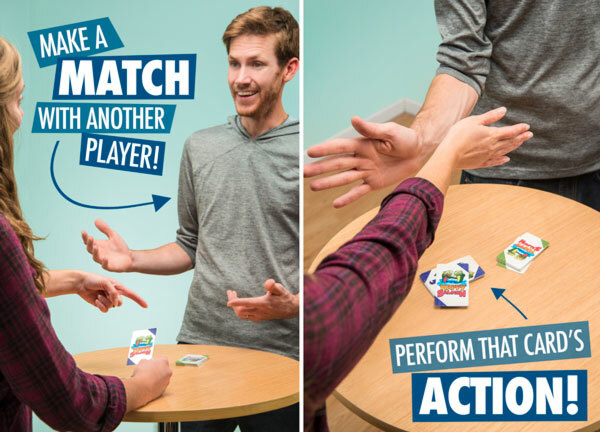 In this crazy card game, each player takes a stack of twelve cards. 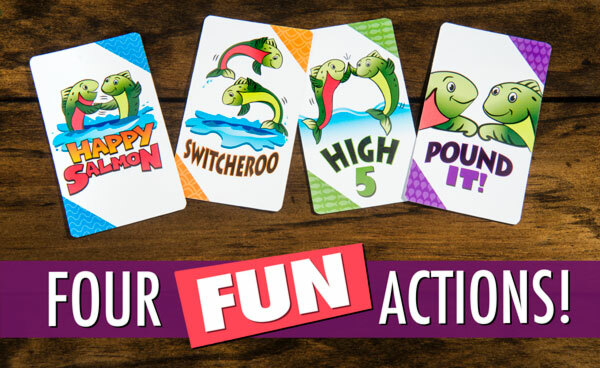 When the game begins, all players start flipping over their cards and calling out the action listed: high 5, pound it, switcheroo, or happy salmon. When you notice someone else call out the same card, be the first to greet them with that action and discard the completed card. The game gets chaotic, so do what it takes to get noticed. The first player to get rid of all of their cards is the winner! In case you were wondering (who wasn’t? ), a Happy Salmon greeting is when you turn your open, upright palm into a fishtail and lightly slap another player’s forearm 3 or more times as they do the same to you. From the moment you unzip Happy Salmon's pouch, the game is frantic fun. 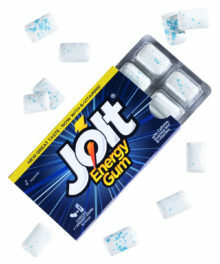 Wildly shout to get the attention of other players, match a greeting, and act it out to whittle down your cards in hand. When you've given enough goofy greetings, the winner will be left with no cards in their hand and a belly full of laughs. Playing Happy Salmon is incredibly easy. Hold your deck in one hand and keep your other grabber open for greetings. Show and shout out the name of your card, rising above the rabble until you find a match. Pair up, share a greeting, and move on to the next card. Really, that's it. It sounds dumb because it is. 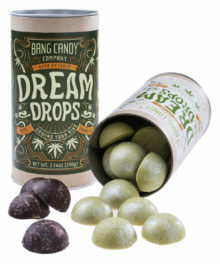 But it's also a ton of fun! Drop your strategy on the ground with your discarded cards. Discard your cards when you match with another player and share one of the four different greetings. You might slap skin with a high five, pound it with your fists, switch places, or do the Happy Salmon. This especially silly greeting has you extend your palm for a handshake, but instead of clasping grips, keep going. When you get to the forearm, give it a series of light slaps, like a fish flopping out of water. Who knew just four gestures lead to endless fun? 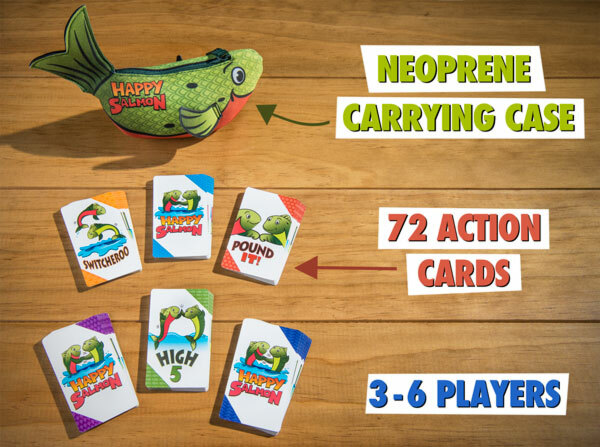 Happy Salmon includes six sets of twelve unique cards for a total deck size of 72 cards. That stack lets three to six players have a go at these silly salutations. 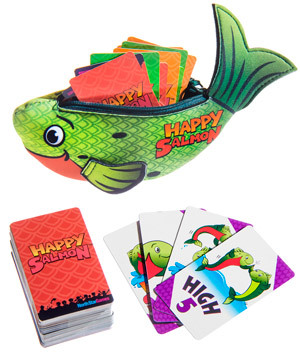 The cards easily stow away in a neoprene zippered pouch that's shaped like a fish. Question: So it's Go Fish? Answer: Not at all. The lack of turns and silly gestures make Happy Salmon a frenzy of fun that's not easily comparable to most other card games. Question: How do you do the Happy Salmon? 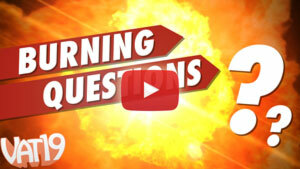 Answer: With an open palm, lightly slap another player's forearm 3 or more times. 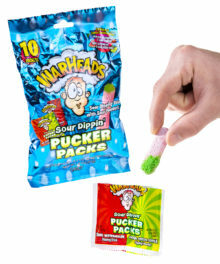 For added authenticity, imagine that your hand is a fish tail.